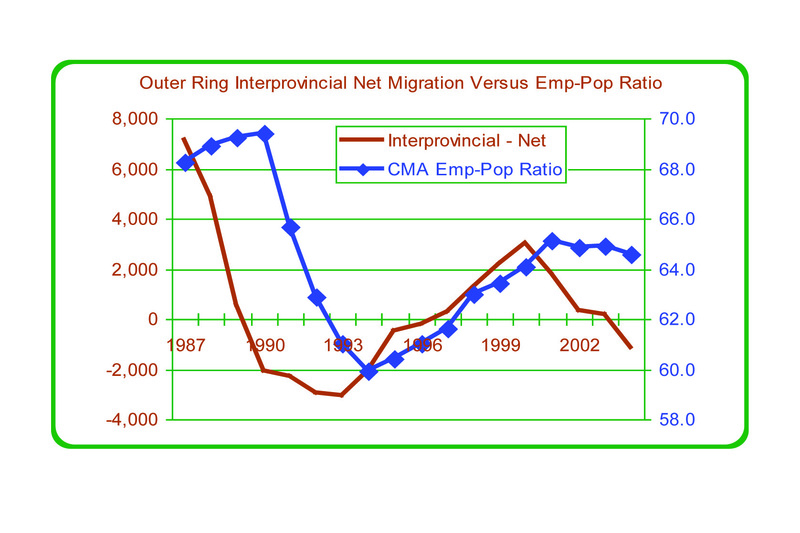 Figure 15 shows net interprovincial migration for the Inner Ring (net migration is equal to in-movements minus out-movements). There appears to be a strong relationship between net interprovincial migration and the Toronto CMA's employment ratio. 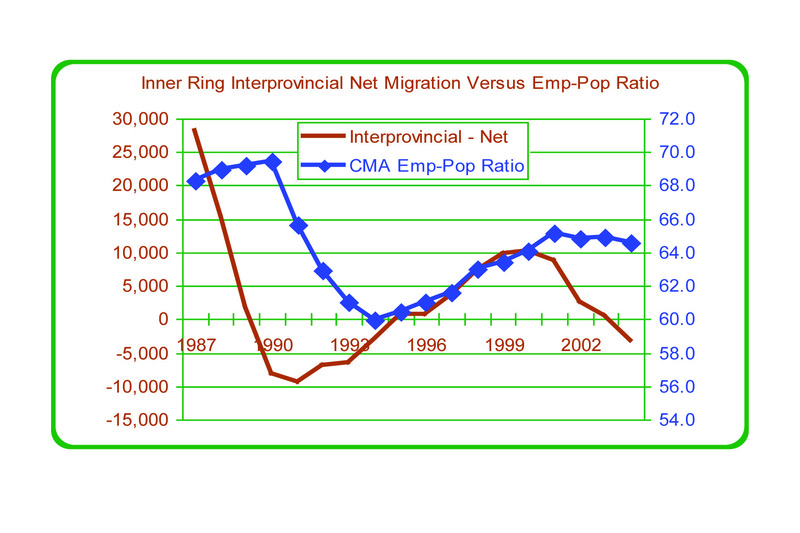 At the end of the 1980s, a plummeting employment ratio was mirrored by plummeting net interprovincial migration. Indeed, between 1990 and 1994, more people left the area than arrived. The economic recovery during the second half of the 1990s improved net interprovincial migration. Since 2000, it has dropped again, and in 2004, more people left than arrived. The rapid deterioration in interprovincial migration between 2002 and 2004 occurred at a time when the employment-to-population ratio did not change very much. 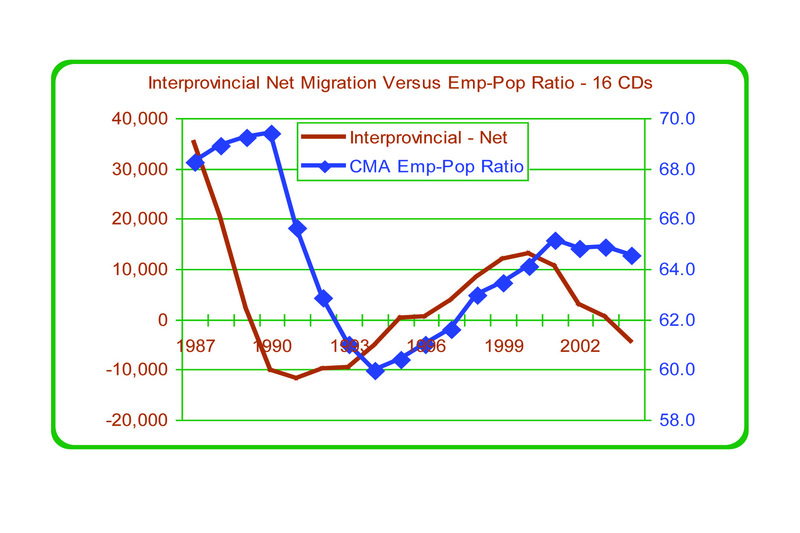 Similarly, during the late 1980s, net interprovincial migration fell before the employment rate did. 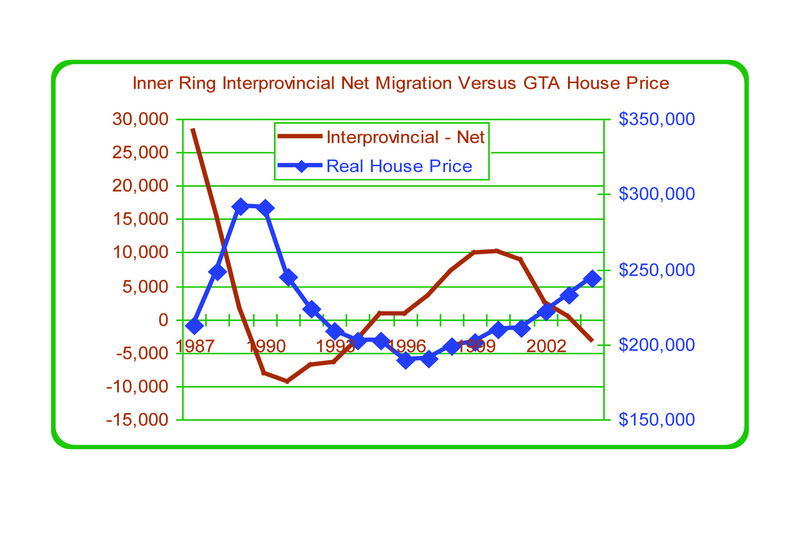 Figure 16 indicates that rapid increases in GTA house prices may have contributed to the fall in interprovincial migration in both the late 1980s and more recently, and that falling prices may have contributed to a recovery of interprovincial migration during the early to mid 1990s. Interprovincial migration varies widely over time, and average figures can be misleading. Thus, while net interprovincial migration to the Inner Ring averaged about +2,500 people per year from 1991 to 2001, this period included several years of strong economic growth and strong migration (averaging +9,600 people per year between 1998 and 2001) and several years of weak economic conditions and negative migration (averaging -5,500 people per year between 1991 and 1994. Future interprovincial migration will depend upon economic conditions. 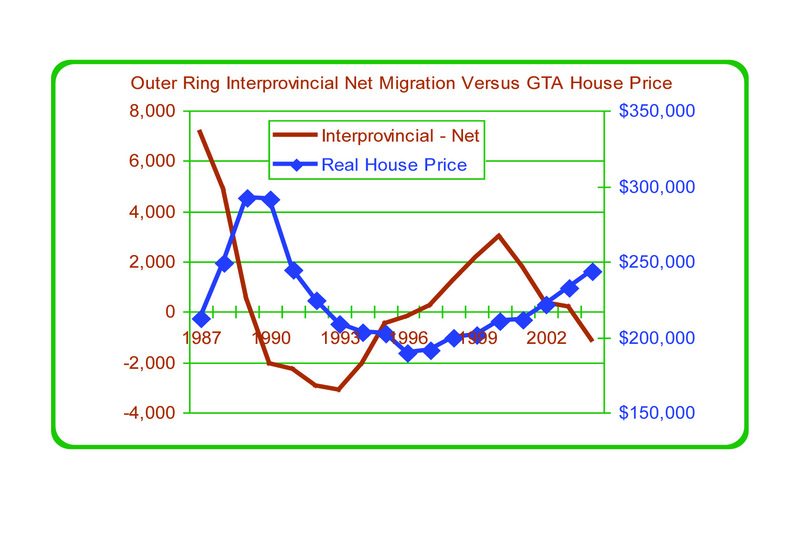 Figure 17 shows that interprovincial net migration for the Outer Ring tends to be positively related to the economic cycle in the Toronto Area. In other words, economic strength in the GTA encourages people to move from other provinces to the GTA and to surrounding areas. 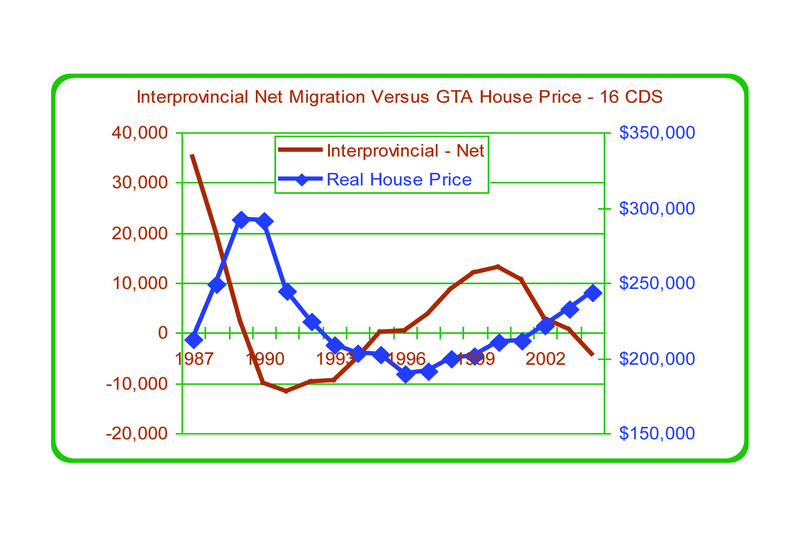 Similarly, net interprovincial net migration is negatively related to GTA house prices, as shown in Figure 18. Combining the data on interprovincial migration for all 16 Census Divisions of the Greater Golden Horseshoe, it is seen once again that the Toronto CMA employment ratio is positively related to net migration and that GTA house prices are negatively related to migration (see Figures 19 and 20).